Although casualties were extremely light, the battle's strategic impact was far greater than one might assume from its limited nature. The Union victory here established what would become an unbroken Federal control of the Missouri River, and helped to thwart efforts to bring Missouri into the Confederacy. Four battles were fought at Boonville during the Civil War: the first battle forms the main subject of this article, while the others are described below under "Other battles at Boonville". The battle itself was actually little more than a skirmish, but it was one of the first significant land actions of the war, and had grave consequences for Confederate hopes in Missouri. After disembarking, Lyon's troops marched along the Rocheport Road toward Boonville at around 7 AM. Marmaduke's ill-equipped State Guard companies waited on a ridge behind the bluff, totalling about 500 men. They had no artillery support, since it was all with Parsons at Tipton. 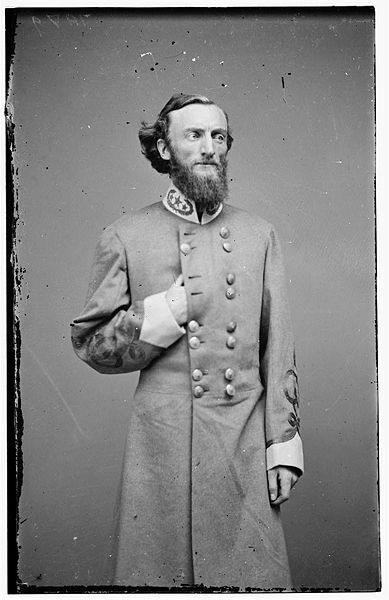 Inexplicably, Governor Jackson, observing from a mile or so away, held his only reasonably-disciplined and organized command (Captain Kelly's company) in reserve; it would take no part in the battle. Lyon's command encountered State Guard pickets as they approached the bluffs, but Lyon deployed skirmishers and continued to push his men forward rapidly. 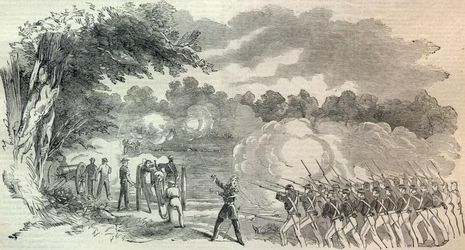 The Union artillery quickly displaced sharpshooters stationed in the William Adams house, while Union infantry closed with the line of guardsmen and fired several volleys into them, causing them to retreat. This portion of the fighting lasted barely 20 minutes. Some attempts were made to rally and resist the Federal advance, but these collapsed when a Union company flanked the Guard's line, supported by a siege howitzer on one of Lyon's riverboats. As Marmaduke feared, the Guard's retreat rapidly turned into a rout. The guardsmen fled back through Camp Bacon and the town of Boonville; some continued on to their homes, while the rest retreated with the Governor to the southwest corner of Missouri. Lyon took possession of Boonville at 11 AM. The short fight at Boonville and the State Guard's precipitate retreat earned the battle the nickname of "The Boonville Races."